Each silence fragments the soul. Piece by piece it falls apart. 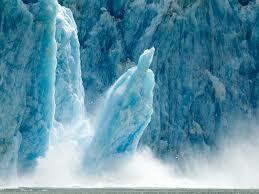 Like a glacier calving in the Age of Global Warming. Too little is left to hold out any longer against the toxins in the institutional air I breath. I once thought old people grew old souls. Hived off block by block by compromises we should not have made. A backwash filled with the havoc my sins have wreaked. What happens when the soul is gone? What happens when it’s all a sea filled with wreckage and debris? What happens when we feel too old and hurt to swim to shore? Souls ice over so we can get on by going along. So we can bear the pain of stupidity. But forms of life that make us all unwise. But perhaps from the litter in our soulless sea we can fabricate a new soul. We can make from the garbage a new more fragile but angry soul. Fragile because we always knew the kids who played symphonies with instruments made from trash were more worthy than the rich kids who padded their applications to Harvard with expensive instruments played with no passion. Angry because we sacrificed our first soul on an altar to false gods. Because we are “differently abled” now.